I'm sure you've heard everyone saying, mobile is growing quickly. About 87% of Facebook traffic is mobile and mobile ads bring in up to 73% of Facebook's advertising revenue. As an affiliate, or marketer in general, you are leaving a lot of money on the table by not optimizing your funnels for mobile. The first step is to make your pages responsive, this improves the mobile user experience and should help you convert more of your mobile clicks. I recently spent some time making the Tracking202 website more responsive and optimized for mobile so I thought I'd share some of the tools and resources I used to get the job done. Today I'll start off with a simple trick that will help you with testing the look and feel of your site on multiple mobile devices. I did this all on my laptop without having to use my phone. The added bonus is that the tool I used is 100% free, and you probably already have it. All the major web browsers provide ways to either change the browser's user agent or resize the window to match that of mobile devices, but the best browser for this is Google Chrome. So we will use Chrome for this tutorial. Chrome's developer tools provide an extensive set of tools that will simplify your life as an affiliate. To get to it, I usually right click on the page and click 'Inspect Element', it's the last item on the list. Once you are in Dev Tools, you will want to enable Device Mode, to do this simple click Toggle Device Mode icon, the icon should turn blue. Your screen should look something like the following. From here you can do quite a few nifty things such as choose from a predefined list of mobile user agents. The cool thing is the Chrome will actually emulate the screen size as well so you get a relatively good representation of what your end users will see and experience. You can click this icon to rotate the screen to simulate landscape mode on the device. Due to broadband adoption, one of the things we tend to overlook is the time it take to load a page from a mobile connection such as GPRS, 2G, 3G, 4G etc. Using the network connectivity emulator, you can see just how slow you pages load under different conditions. For example the Prosper202 website takes 16 seconds to load on GRPS and about 3 seconds on 4G but on my connection it only takes 1 second to load. To test out how quickly your page loads under different network conditions, use the network drop down and select the connection speed you want to emulate it even takes round trip time (RTT) into consideration. 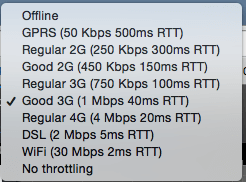 Actual load times are available on the network tab. 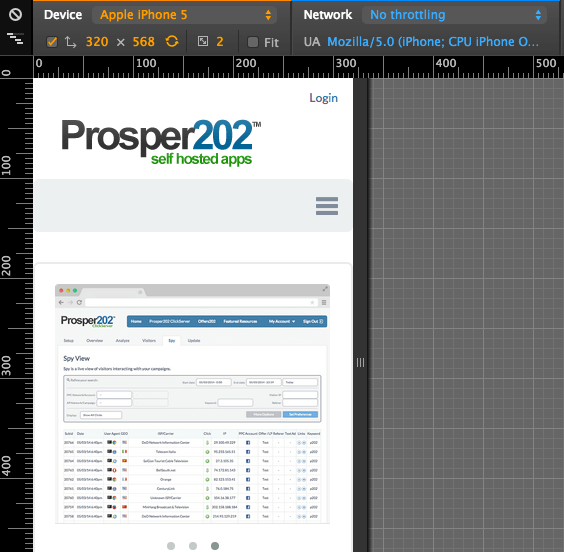 By now you should be able to see how you can use Chrome Dev Tools to test your mobile landing pages to make sure they look good, and load fast on mobile devices.